Are you concerned about the high content of sugar in fruit? No way, not at all! Many people believe one should avoid eating an excessive amount of fruit because of the high sugar content. I completely disagree. I cannot recommend any other food higher than pure, raw fruits. Fruits are high in antioxidants and astringents and have the highest magnetic energy of all foods. They are excellent brain and nerve foods, keep your lymphatic system moving and are superior in your bodies natural detoxification process. The three main components your body requires to function are amino acids, (protein) fatty acids and sugars (carbohydrates), however it is the sugar mixed with oxygen that is vital for your body to run. It is important to understand that there are two different types of sugars, simple sugar and complex sugar. 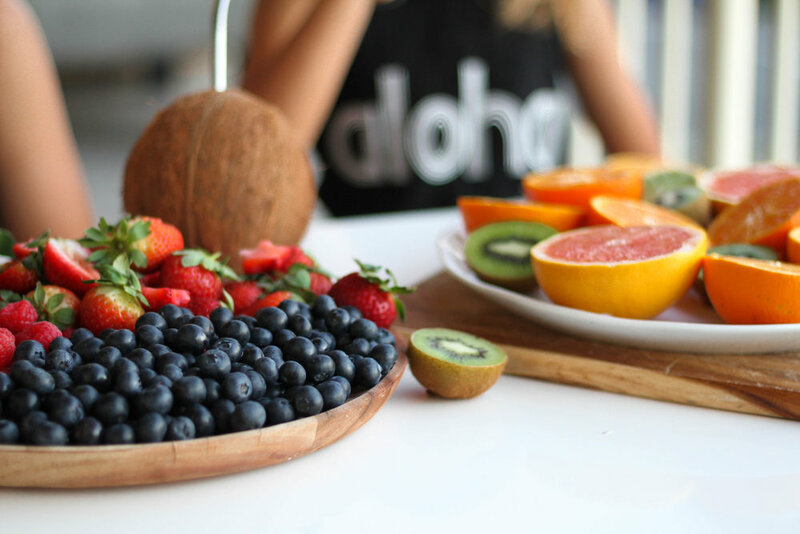 Simple sugars (fruit), require minimal digestive effort and convert easily into carbohydrates which our body will then use to nourish, repair and energise cells. Complex sugars (processed food etc) require much more digestive effort to convert into simple sugars before they can be used and demand high levels of cortisol from the adrenal glands. The body will then excrete what it can, store some of it as fat or rid itself of any unused sugar through fermentation which causes acidosis. (an acidic body) There is a big difference between the two sugars. My moto - eat more fruit! Plant-based foods high in amino acids include most plants, nuts and seeds, dark leafy greens (spinach, kale, collards), raw green beans, sunflower seeds, pea sprouts, hemp seeds, pumpkin seeds, sesame seeds, sunflower seeds, quinoa and brown rice. These are my favourite sources of plant protein. Beans, legumes and soy also contain protein however these foods are acid-forming in the body, therefore they are not my preferred choice of amino acids. Fruits and vegetables contain simple amino acids (protein) our body will very easily break apart to use, causing no harm in the body what so ever while leaving an alkalising ash. They are a superior (if not the best) form of amino acids for the human body. To read more about protein click here and scroll down..
What plant-based foods provide calcium and iron? Calcium is an essential mineral our body requires for bone, cartilage, tendon and connective tissue strength and growth as well as many other functions in our body. You can find an abundance of calcium from the following plant-based foods.. dark leafy green vegetables, broccoli, kelp, carrots, oranges, papaya, walnuts, cashews, Brazil nuts, sunflower seeds, sesame seeds, brown rice, tofu along with many other fruits and vegetables. Iron is essential for the formation of red blood cells and is primarily involved in the transfer of oxygen from the lungs to tissues. An abundance of iron is found in the following plant-based foods.. dark green leafy vegetables, kelp, parsley, cucumbers, spinach, root vegetables, broccoli, green peas, avocados, asparagus, carrots, oranges, grapes, bananas, prunes, raisins, figs, sesame seeds, pumpkin seeds, nuts such as almonds, cashews and hazelnuts, whole grain products and many other fruits and vegetables. Do you take Vitamin B12 or any other supplements? The only supplement I do take is Vitamin B12 as I have only recently experienced lower levels of active B12 in my body. I do not however take any other supplements. I check my bloods regularly and this is something you will need to keep an eye on for yourself as many people do suffer from low B12 levels - vegan or not! B12 is an important vitamin essential for growth, production, and regeneration of red blood cells. Plant-based food sources that are said to have traces of B12 include blackstrap molasses, nutritional yeast, fortified cereals and nut milks as well as some claims of being minute traces in mushrooms, bananas, sunflower seeds, comfrey leaves, kelp and concord grapes. In addition to this, there are many natural supplements available from health stores, naturopaths and online. The B12 supplement I personally take and would highly recommend is called Max B12 - ND by Premier Science Labs. It is a superior non synthetic, rich source liquid form of the B12 vitamin. They also have Max B - ND which is another great source of all essential B vitamins. You can easily order these supplements from many online health stores. Are you missing out on essential nutrients from not consuming any animal products? No. I believe there is very little extra you will attain from eating animal products that you cannot get from eating a variety of plants. Plants will nourish your body and provide you with an abundance of the nutrients you need to not only survive but to absolutely THRIVE while causing no damage in the body what so ever. I have had regular bloods test every 3 months for the last few years (due to my autoimmune disease) and since becoming vegan, I have never been deficient in protein, iron, calcium or any other essential vitamin or mineral with the exception of only recently experiencing lower levels of active B12. Many people adopt a vegan diet but choose the more acidic, processed path and therefore fail to meet their nutritional needs.. Providing you are eating a vast variety of fresh fruits, vegetables, nuts and seeds and in adequate amounts, you should be attaining most of your nutritional needs. How did you help your children transition into a plant-based lifestyle? Helping children transition is a common question I get asked. From personal experience as a mother of two boys, I found taking it slowly and involving my boys in the process, helped a lot in their transition into a plant-based lifestyle. Instead of stripping everything away at once, I took smaller steps and this approach worked well for my boys. It was more of a gradual change as they slowly adapted to a new way of eating. Educating them was another key factor. This helped them to understand why we were making this big change in our family in the first place. It was also vital to be consistent in making healthy plant-based meals and ensure they were eating plenty of food for sustained energy. Finding vegan recipes they enjoyed and involving them in the preparation was a good way to encourage them to eat more and also ensuring there was always plenty of healthy snacks at home, such as fresh fruit, dried fruit, nuts, bliss balls, homemade nut bars, rawnola and smoothie essentials. Also, it is important to ensure they are eating a vide variety of healthy plant-based food to ensure they are receiving a well balanced diet, full of all the essential nutrients needed for their growing bodies. What do your children do in social situations? Believe it or not, this would have to be at the top of the list of questions I get asked! What do your children do at birthday parties etc? The truth is, my boys are educated and are now old enough to make their own decisions in these situations. They're not interested in the likes of meat or coke etc but when it comes to a little sweet treat, they will often have a little nibble. They eat a healthy, well balanced diet at home so at the occasional social event, they enjoy indulging a little too! Can you give me some ideas or any book recommendations to help me transition to a plant-based lifestyle? For sure! Click here for many ideas and recommendations! I'm just transitioning and I feel so hungry? You need to ensure you are eating enough food! Many people make the mistake of not eating enough when they first switch to a plant-based or raw food diet and become hungry and frustrated! You will need to eat much more than you would normally eat to provide a sufficient amount of calories and carbohydrates for sustained energy. Listen to your body, eat when you feel hungry and eat until you are full and satisfied! Remember this is not the kind of food that will send you to the couch 5 minutes later with a sore tummy. This is real, wholesome food and will provide you with everything you need when consuming a vast variation in adequate amounts. I eat an abundance of raw fruit and vegetables every single day! I actually like to keep it pretty simple (anyone who knows me, knows this haha!). Most of my day consists of fresh fruit and fruit smoothies, a fresh cold pressed juice, snacks such as medjool dates, figs, raisins, nuts, hemp seeds, fruit mono meals etc.. Sometimes I'll snack on smashed avocado, lemon and carrot sticks, organic brown rice cakes or raw dehydrated crackers topped with salad. In the evening I usually have a large salad full of fresh organic greens, beetroot, carrot, sprouts, herbs, avocado, sweet potato or occasionally quinoa and I love adding a squeeze of lemon or lime or making my own dips and dressings. I do not eat any processed food, gluten, meat, fish, dairy or eggs. Do you consume alcohol and caffiene? No. I haven't consumed any black tea, coffee or alcohol in over 2 years now. This is a personal choice that works for me. I've never been a big drinker so this doesn't affect me but at a social event such as a wedding etc, I'm sure I would enjoy a casual glass of red wine again one day. I dont think I would ever jump back on the caffeine wagon though! No, I personally never count calories... or stick to any fad diets! I listen to my body and I eat a variety of healthy food when ever I feel hungry! Why raw? Whats the big deal? Raw food is undoubtably the ultimate road to robust health and longevity. Cooked foods are pretty much dead foods. They go from being highly alkaline to acidic and mucus forming which become much harder to digest, can cause loss of energy, acidosis and be taxing in the body, instead of being used for rebuilding and vital energy. Majority of my diet are raw fruits and vegetables and I feel amazing for it! You can read more on the incredible benefits of raw food here. Do you personally eat 100 percent raw food? The majority of my diet is raw fruit and vegetables and a few nuts and seeds. I would say about 95 percent. Potatoes, pumpkin, a little quinoa and the occasional lightly steamed vegetables are pretty much the only cooked foods I eat. How do you afford to buy Organic? I prioritise! Health has become such a big priority for both myself and my family. We spend more money on healthy food than anything else! Organic produce is always ideal, especially in avoiding pesticides and other toxic chemicals, however understandably it is not always entirely possible nor affordable for many people to eat organically all of the time either. Just do the best you can, find your local organic farmers markets and if you can not shop organically, (or don't have a veggie garden) try to ensure you wash your produce with a natural vegetable wash before consuming them. Remember, you are far better off attaining the nutrients from washed, non organic produce than avoiding them all together. Here is a simple homemade fruit/vegetable wash recipe.. Mix all ingredients together and pour into a spray bottle. Squirt your produce 3 times, let them sit for a few minutes and then rinse under cold filtered water before consuming. Where do you buy your organic produce from on the Gold Coast? Markets! My favourite market is the Gold Coast Organic Market at Miami High and Freemans Organic Farm. They are both open every Sunday morning and there are also a few organic stalls at both the PBC and Burleigh markets on Saturday mornings. Do you have any ideas of what to do when living in cooler climates with limited fruit and produce or in smaller towns with limited pantry alternatives? Try to substitute with what you do have available! Most recipes can easily be adjusted using any in-season fruit or produce you have on hand. It is also far more beneficial for you to eat the foods that are naturally growing in your current climate and season. In terms of pantry staples, there are now many great online health stores/supermarkets (many with worldwide shipping or try to find the one closest to your region) that will offer a vast selection of healthy, plant-based and gluten-free pantry staples. I have a Vitamix Professional Series 300 and I absolutely love it!! They are by far the best blenders I have ever used and are perfect for making almost anything! My blender is my absolute favourite plant-based tool. What juicer do you use? I have an Omega cold-pressed slow juicer. I find it easy to use and super easy to clean! What autoimmune disease did you have and how did you reverse it? I had Graves' Disease, an autoimmune disease that attacks the thyroid gland causing it to become over active which then hosts a number of symptoms. I reversed this disease through a process of detoxification. You can read my full story here or learn more about the detoxification process here. I try to keep it simple, minimalistic and as natural as possible! I use either organic olive oil or coconut oil on my body as a moisturiser for my legs and arms etc. For my face, I use a natural plant-based cleanser and moisturiser and I only use natural deodorant and cosmetics. The awareness of chemical-free skincare has increased hugely over the last few years resulting in a large variety of natural, plant-based skin care and cosmetics. Remember, our skin is like a large sponge that will absorb every single product applied to it, directly into the bloodstream. What sunscreen do you use for both yourself and your children? We only use natural zinc based sunscreen and we try to cover up as much as possible to avoid burning and having to use so much!